The Panther on our logo? In 1875, the Dallas Herald published an article by a former Fort Worth lawyer, Robert E. Cowart. Mr. Cowart wrote that the decimation of Fort Worth's population, caused by the economic disaster and hard winter of 1873, had dealt a severe blow to the cattle industry. He further stated that the impact on the cattle industry, combined with the railroad stopping the laying of track 30 miles outside of Fort Worth, had caused Fort Worth to become such a drowsy place that he saw a panther asleep in the street by the courthouse. Although an intended insult, the name Panther City was enthusiastically embraced when in 1876 Fort Worth recovered economically. Many businesses and organizations continue to use Panther in their name or as their mascot. 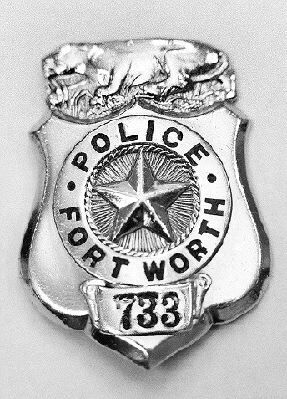 The Fort Worth Police have a panther prominently set at the top of their badges. In 2003, the Fort Worth Astronomical Society held a contest among its members to update it's old logo to something newer and dynamic which represented the association with Fort Worth and better represented our hobby. This was the winning design. FWAS adopted a logo depicting the sleeping panther atop its shield in reference to its historical association with the city of Fort Worth. Over the last few years the logo has been changed to have a round shield, and the panther itself has been modified a couple of times, but the basic design has remained unchanged.